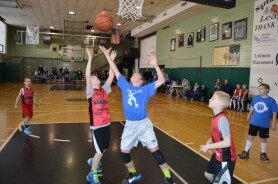 The JCC has many basketball leagues and events, something for every basketball lover. 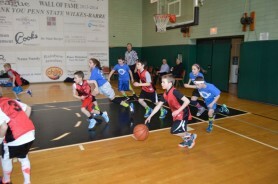 The Basketball League is organized by the Wilkes-Barre JCC fitness and recreation staff. This league is for boys and girls ages 5 through 13 years. Practice sessions and Sunday games are held from November through March with a banquet held immediately after the championship game. The leagues are divided by age groups. This clinic is a setting for young boys and girls to receive instruction on basketball basics such as dribbling, passing, shooting, and defense. The clinic is run by both JCC and YMCA staff as well as volunteer players from Penn State Wilkes-Barre and Wilkes University. The children play on eight foot baskets and have fun while learning the skills needed to advance to the league. Every participant receives a t shirt. This division is played by boys and girls on eight foot baskets. There is no press defense or three point shots allowed. Because of the participants’ age at this level, the officiating is more lenient as players attempt to fine tune their skills in preparation for play at the next level. Moreover, the official often provides on the court instruction for players teaching them how to line up for foul shots properly and how to correctly move with the basketball in hand. There is also an emphasis on the “team” concepts. Coaches establish a positive rapport with their teams providing instruction at both games and practices. For many players, this is their first experience playing the game of basketball. Games are played at the JCC gymnasium on Sundays. Practices are held during the week and games are on Sundays at the JCC gymnasium. The games at this level are played on 10 foot baskets. Three point shots and press defense are limited to the end of each half. Like the 8-10 year olds, teamwork is promoted and enforced through close mentoring by the coaches and referees. Attendance for both practices and games is expected as players begin to rely on each other. This division is more competitive than the younger division, however, children are encouraged to play regardless of skill level. The first game will begin at 7:00 pm with the High School Varsity All Star game. The second game will start at 8:15 pm and will have the Senior Men’s League All Stars against the College All Star Team. The college teams are mostly made up of former JCC basketball players who developed their skills through the JCC system. The tournament is directed by Bruce Weinstock, JCC Basketball Chairman. For more information, please call Rick Evans at 570-824-4646. JCC High School League will be held Monday evenings at 6:15 pm at the JCC beginning in November. Cost $50.00 or $300.00/team. The JCC High School Basketball Program is being directed by Dan Messinger. JCC Senior Men's League will be held Wednesday evenings at 6:30 pm at the JCC also beginning in November. Cost $90. Bruce Weinstock is commissioner. Please contact Rick Evans for registration information at 570-824-4646.